stickboybike: Thoughts from the road. It's been a tough 2 months. I am finally getting some miles on the T-Cube after a two month drought of riding. As I was out rolling along this morning some thoughts accumulated in my brain. The thoughts were mostly instigated by the garbage along the road; here are a few ideas that by no means are trying to come off with an elitist attitude towards those who don't exercise or consume some levels of proper nutrition but I digress. 1.) Fast food trash being thrown out the window. Garbage along the road. -Any stretch of back road, the gutter at the traffic lights, the hillside along the end of the exit ramp of a major highway. Trash accumulates. Most of this waste is comprised of empty containers; 16oz soda bottles, ice tea containers, fast food bags and wrappers. Cigarette butts. If the perpetrators of trash packed a lunch, went grocery shopping and cooked a dinner for their family to enjoy, there would be less fast food trash out the window. 2.) Destroy what you enjoy. -I did a post entitled that saying a year or so ago. Some of the meaning can stem from- Taking more than you give. Too much of a good thing can be bad. Neglect is irreversible. One instance was the closure of Mountain Biking in Pennsylvania State Gamelands. 1.2 million acres closed due to a few irresponsible individuals building illegal trails, another routing a race through a sensitive vegetation area and a money hungry bureaucrat Jerry Feaser with the Pa Game Commission. This is a photo of me from that race that was ran through an area that the promotor was instructed to not route through. That's the past but never the less it became a strike against the mountain bike community quickly. The photo is circa spring of 1996. 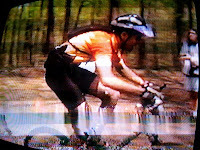 I was about 175 lbs soaking wet, riding 4-5 days a week and IMOP better shape then. I was pedaling a dual suspension Jamis Dakar Team frame with a cluster of XT/XTR bits that I pulled off a previous build. I was laughed at back then for installing a Rock Shox Judy DH 80mm fork on a Cross Country platform. 'What do you need 80mm of travel for?!' my riding mates barked. I smiled and replied, trust me, you will. 12 years later the DH fork has changed how we use suspension as we know it. Valving, oil and full start and finish stroke adjustments are common place on the DH circuit. The video clip that contained this screen shot was quite an eyeopener. I starred at the video clip in disbeleif of the mass of racers on hardtails, canti brake equipped bikes. Helmets with only 10 vents, hairy legs, baggy slopping fitting jerseys (xc racing only). There is a lot of bike technology that I have taken for granted over the years. On a brighter side, the video was the first time that my 6 year old son has seen me racing a bike and hearing spectators call out my name, he liked that a lot. Interbike, 3 days and counting. Flight leaving Sunday morning.